The French painter Pécheux spent twenty-four years of his career in Rome, from 1753 to 1777, before moving to Turin to become director of the art academy there. 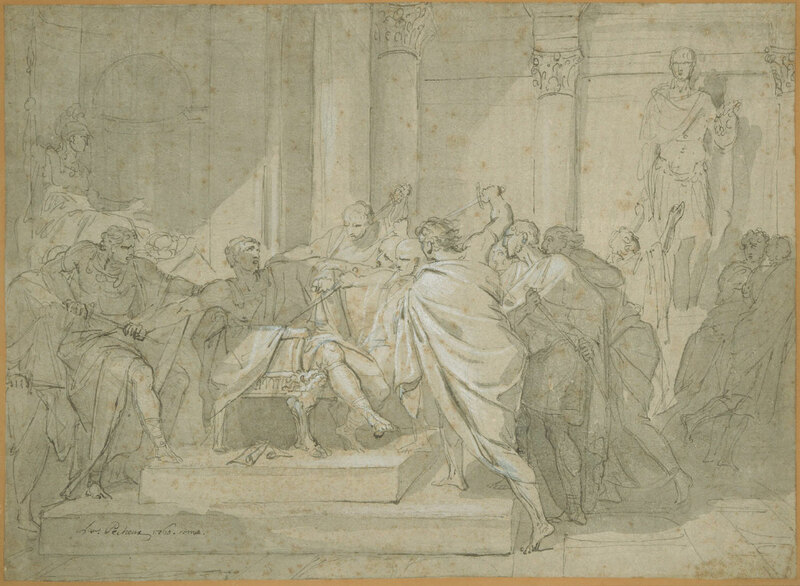 The type of subject depicted in this drawing, a tragic event from ancient Roman history with "sublime" and horrific overtones, was characteristic of early Neoclassical tendencies in Roman painting. Although not associated with any of the paintings that Pécheux lists in his memoirs among those he did during his long stay in Rome from 1753 to 1777 (Bollea 1936, passim), this drawing has the characteristics of a finished compositional study, in which the nervous and choppy draftsmanship (perhaps recollections of Pécheux's youthful studies after the etchings of Pietro Testa) and the rapid execution are accompanied by an exact definition of the various roles of the characters, the architectural setting, and the contrasts of light and shade. The painting, if ever executed, by virtue of its subject from Roman history would be grouped with those painted by the artist at the request of James Adam (in Rome between 1761 and 1763; see Ingamells 1997, pp. 4--5), namely The Meeting of Coriolanus with His Mother and Attilius Regulus. But while these were recognized examples of heroism and patriotism, which had acquired a particular contemporary significance as anticipating the Neoclassical exemplum virtutis, the theme of the death of Caesar is evidence that in eighteenth-century classicist Rome attention continued to be focused on the city's ancient history. Patrons could identify themselves either with the Arcadian milieu (Metastasio's drama Attilio Regolo dates from 1740, and soon after the election of Benedict XIV that same year the Accademia di Storia Romana began its activity under the pope's patronage), or else with the cultured English gentlemen gathered in the Società degli Antiquari, who had created a sort of pre-Enlightenment mythology about Rome, its monuments, and its history (an example of this type of patronage is that of Count Carlo di Firmian, who commissioned a Death of Socrates and a Death of Cato from Giambettino Cignaroli at the end of the 1760s; see Palazzo Reale, Milan, Settecento Lombardo [Milan: Electa, 1991], p. 222). In this case the episode of the bloody killing of Caesar by a group of conspirators in the senate right under the statue of Pompey (Plutarch 34, 66) presents a tragic subject that, through lack of any precise ethical values to uphold, is closer to the many versions of the deaths of Cleopatra or Dido (in the same vein as the vogue for Roman subjects treated contemporaneously by Batoni, Bottani, Mengs, and Maron) or to rare depictions of the more savage events of Roman history, such as Caracalla Killing His Young Brother Geta in the Arms of Their Mother, Julia (1775), by Julien de Parme, which, following the example of Metastasio's melodramas, offered artists points of departure for the "sublime" mise en scène loaded with inherent theatricality. In 1724 Giacomo Zoboli completed one of his versions of the death of Caesar theme destined to be considered (Clark 1967; Faldi 1977) a veritable incunabulum of Rome's "proto-Neoclassical" tendencies (as Federica Pirani observes in Paolo Moreno, ed., Lisippo: L'arte e la fortuna [Milan: Fabbri, 1995], cat. no. 7.3, p. 434, the painting is actually an almost exact copy after a fresco by Giovanni Ghisolfi in Palazzo Galli, Piacenza, of 1675). He returned to the same subject on several occasions, associating the death of Caesar with that of Pompey, who was treacherously murdered by Ptolemy (the earliest version of this subject is dated 1731), while later versions of the two deaths, which marked the end of the Roman republic, date from 1748-49 and others are cited in the 1767 inventory of Zoboli's belongings (see Maria Barbara Guerrieri Borsoi, Disegni di Giacomo Zoboli [Rome: De Luca, 1984], p. 19-20, 25-26). Pécheux's drawing, dated 1760, can therefore be linked to this thematic series, which, at least as regards the more "sublime" and horrific aspect of those tragic events, was to work its way out ten years later in the "Roman" painting by John Hamilton Mortimer (who, incidentally, never went to Rome [Pressly 1979, p. 75]) of Sextus the Son of Pompey Applying to Ericthto to Know the Fate of the Battle of Pharsalia, exhibited at the Society of Artists in London in 1771. In Rome the series appears to end with the Death of Caesar by Vincenzo Camuccini (1798; commissioned by the Bishop Count of Bristol; see Ingamells 1997, p. 129), which had some influence on Jean-Léon Gerôme's theatrical canvas of 1867 (Walters Art Gallery, Baltimore). In the spatial layout of Pécheux's composition the setting consists of a single plane derived from Poussinesque models such as The Death of Germanicus, then in the Palazzo Barberini, and the series of The Seven Sacraments, which Pécheux could easily have seen in the Boccapaduli house. The didactic value of the latter series was further emphasized by the Memorie per le Belle Arti after the paintings had been fraudulently exported as the works of Gavin Hamilton, another artist well versed in Roman history, whose Death of Lucretia (1769; see Art in Rome cat. 231) ratified the movement toward a more deliberate adherence to the values of republican Rome. Stefano Susinno, from Art in Rome in the Eighteenth Century (2000), cat. 385, pp. 542-543. Bollea, Luigi Cesare. Lorenzo Pécheux, maestro di pittura nella R. Accademia delle Belle Arti di Torino. Turin, Italy, 1936. Ingamells, John. A Dictionary of British and Irish Travellers in Italy, 1701-1800: Compiled from the Brinsley Ford Archive. New Haven and London: Yale University Press, 1997. Clark, Anthony M. "Sebastiano Conca and the Roman Rococo." Apollo, n.s. vol. 85 (1967), pp. 328-35. Faldi, Italo. "Gli inizi del neoclassicismo in pittura nella prima metà del Settecento." In Convegno internazionale nuove idée e nuova arte nel '700 italiano, Rome 19-23, maggio 1975, pp. 495-523. Vol. 26 of Atti dei Convegni Lincei. Rome: Accademia Nazionale dei Lincei, 1977.